The ship’s Dr. Seuss WaterWorks provides fun for kids of all ages. 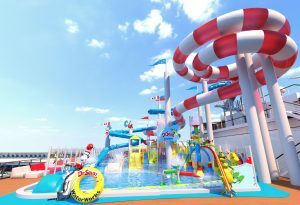 Watery activities include a 450 foot enclosed raft slide called The Cat in the Hat slide, an enclosed body slide with special lighting effects called the Fun Things slide, a 150-gallon tipping bucket patterned after The Cat’s hat, and a kiddie splash zone with dozens of water spray toys. SportsSquare, Horizon’s area for active, less watery fun, is where you’ll find SkyRide (a suspended bike ride high above the ship’s deck) and the SkyCourse ropes course, plus volleyball, ping-pong, soccer, and mini-bowling. For a quiet escape, Horizon provides a Serenity adults-only retreat, with lounge chairs for relaxing and a chopped salad station for a quiet and healthy bite to eat. Carnival Horizon also provides entertainment options for evening fun. This ship has not one, but two, on board movie theaters – one is an IMAX theater and the other shows 3D films. Playlist productions presents talented performers in a variety of lively music and dance shows, while Lip Sync Battle provides participatory fun without requiring any actual musical talent at all. Specialty dining options on the Carnival Horizon include Bonsai Teppanyaki, Bonsai Sushi, the Seafood Shack, Fahrenheit 555 Steakhouse, The Chef’s Table, JiHi Asian Kitchen, Cucina Del Capitano, and, of course, there’s the ship’s main dining room and other complimentary dining options such as the Lido Restaurant, Fresh Creations salad bar, Sea Day Brunch, Pizzeria del Capitano, the Carnival Deli, Breakfast Grill, Captain’s Pasta Bar, Comfort Kitchen, Good Eats, the Blue Iguana Cantina, and Guy’s Burger Joint. 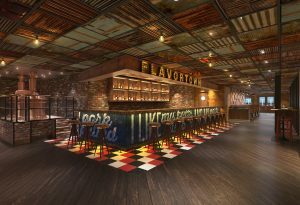 In addition to the complimentary Guy’s Burger Joint, the Horizon has a new Guy Fieri specialty eatery, Guy’s Pig & Anchor Bar-B-Que Smokehouse|Brewhouse, which serves down-home smoked-on-board barbecue and traditional sides created by the renowned chef, along with a selection of distinctive craft beers brewed on board at a brewery located within the restaurant. 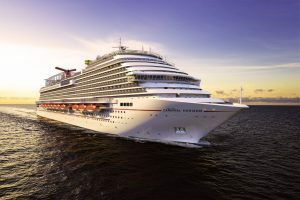 Carnival Horizon introduces a new stateroom category for the line – aft-view extended balcony cabins located within the exclusive Family Harbor area. Like the other 86 staterooms within Family Harbor, the new aft-view extended balcony cabins feature a colorful nautical theme and are located adjacent to the Family Harbor Lounge, designed as the ultimate family hangout with large screen TVs and complimentary breakfast and snacks. If the family zone isn’t for you, Havana Staterooms located aft on Deck 6, 8 and 9, offer exclusive access to the Havana area which includes its own Cuban-themed bar and pool. If you’re looking for a relaxing cruise experience, Horizon’s Cloud 9 Spa Staterooms and Suites might be a good choice for you. Cloud 9 Spa staterooms on Carnival Horizon feature exclusive décor and in-room amenities to help soothe you after a long day’s fun, plus Cloud 9 cruisers enjoy priority spa reservations, unlimited access to the thermal suites, and free fitness classes. Cloud 9 staterooms are available in a variety of configurations, from interior cabins to suites.